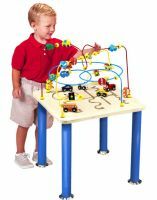 The Traffic Jam Rollercoaster Table is a toy that encourages children to develop eye-hand coordination while having fun! With legs intertwining in unique directions, kids will enjoy pushing and pulling the colorful round cars and traffic signals over and under them. And with multiple pieces and tracks available, children can play solo or in groups for hours! So encourage your child to strengthen their visual tracking and fine-tune their motor skills by participating in stimulating play with the Traffic Jam Rollercoaster Table. Ages 2+.